Can we talk veggies for a minute? Just a minute, promise. You all know by know how I feel about fruits, veggies, salads, etc. Not. A fan. Of the prepping, the cooking, or the eating. So not surprisingly, as I look back at the recipes I’ve posted over the 7 years of writing for this blog and others, I have “maybe” a handful of vegetables. And almost 100% of them are roasted. Butternut squash. Carrots and potatoes. Cauliflower. Tomatoes. Brussels Sprouts. I roast veggies to make fajitas and I roast them to make lasagna. 1.The process is almost completely hands-free – a toss with some olive oil, and not much more seasoning than salt and pepper, and my high-heat oven does the rest. 2.There isn’t a vegetable out there that does not become exponentially more flavorful and delicious when roasted (see above links for the proof). And this ADDICTIVE (did I just use that word about a vegetable?) 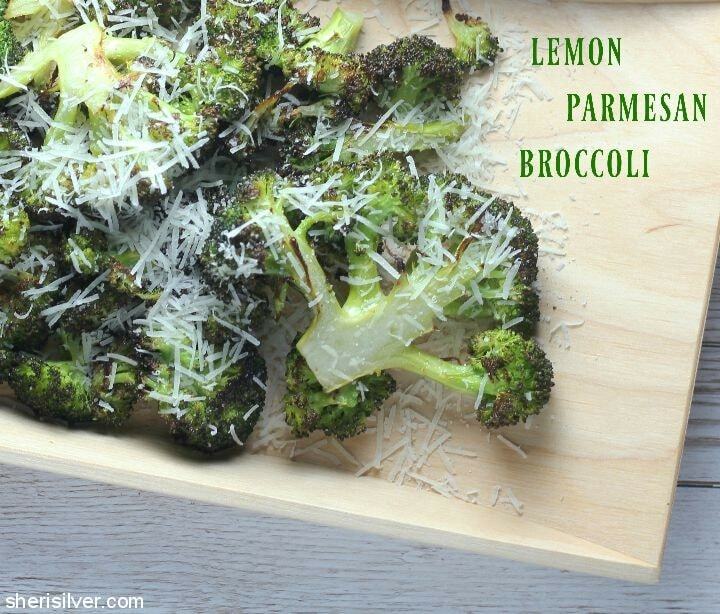 lemon-parmesan broccoli is just another example of why I heart roasting. This dish is a family favorite, and there is never a crumb left over when I serve it. So I serve it a LOT. Look, I know how important it is to eat more fruits and veg. I do. But steaming and sauteeing leave me feeling meh. Is there something I’m missing? Do you have an amazing recipe or two that you’d care to share? Please do! Pre-heat oven to 475 degrees; line a baking sheet with parchment paper. Trim off the rough center stem of each broccoli. 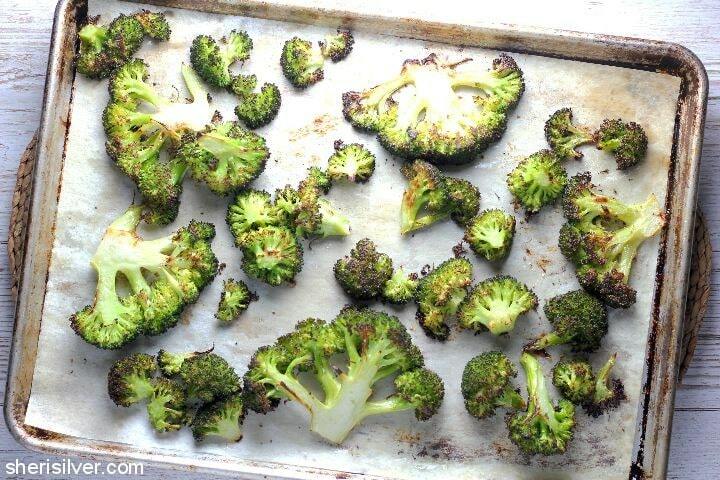 Hold the broccoli upright and, starting from the center, cut into thick slices (don’t worry about the smaller pieces that fall off as you get near the outer edges; you’ll just add those to the mix). 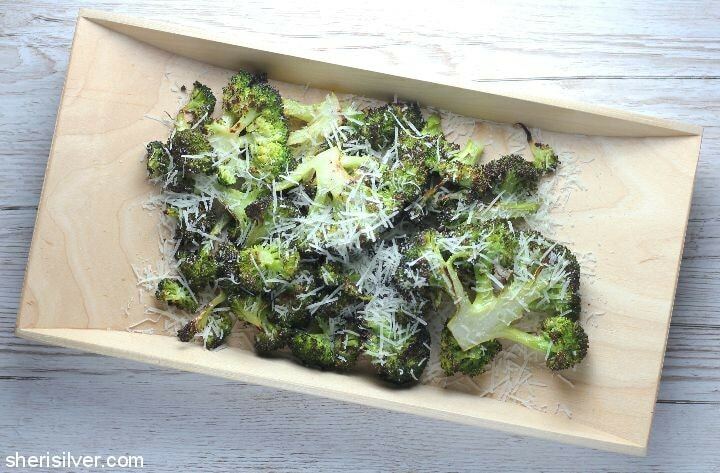 Transfer the broccoli to a large bowl along with the olive oil. Gently toss, being careful to keep the pieces intact, and coating all sides. Lay in a single layer on your baking sheet and season with the garlic powder, salt and pepper. Roast for 10 minutes; flip and return to the oven till deep golden brown (about 8-10 minutes more). Remove from oven and sprinkle the lemon juice over, followed by the zest and parmesan. Serve hot, warm or at room temperature. More dinner ideas on Pinterest! You know we went pescatarian this past January and although I’m happy about it, the prep for all the vegetarian dishes is driving me a bit crazy! I’m getting there though – many new dishes in the rotation. And the girl has become very adventurous in trying all sorts of new things (lentils! black beans!) as she was a big motivator in the switch. Glad it’s not just me – isn’t it funny the kinds of prep that you don’t mind doing vs. those that feel totally annoying?